Helene Eaton had a very successful playing career. As a senior she was selected to the FL All-State Team and then selected MVP at the All-State Tournament. She was also selected first team All County. She then went on to play at the University of Georgia as a middle blocker where she was a 4-year letter winner. While at Georgia she coached Division I volleyball camps every summer. She then pursued her coaching career at the University of Montevallo, AL where she became the assistant coach for 2 years while the team was ranked #1 in the US for NAIA colleges. Both years Montevallo played in the National Championships. She then took the job as the assistant coach at The University of Texas – San Antonio. After one year at UTSA she accepted a job at Alamo Heights High School where she became the head varsity volleyball coach. At Alamo Heights she was able to lead her team that had never won a district championship to 3 undefeated district championships. While in San Antonio she also coached for Alamo Volleyball Club. Helene coached a 5th and 6th grade volleyball team for the new Fort Hunt Youth Program. She was the assistant coach for the Evolution 14N team. Before moving to Virginia in the summer of 2010 Helene started the first club program for Fort Knox, KY. While there she recruited, mentored, coached and guided 40 athletes for 2 years. She coached two competitive teams and 2 recreational teams that participated in tournaments in Louisville, KY.
She then coached Arlington Elite’s top 15’s team and moved to South Florida. 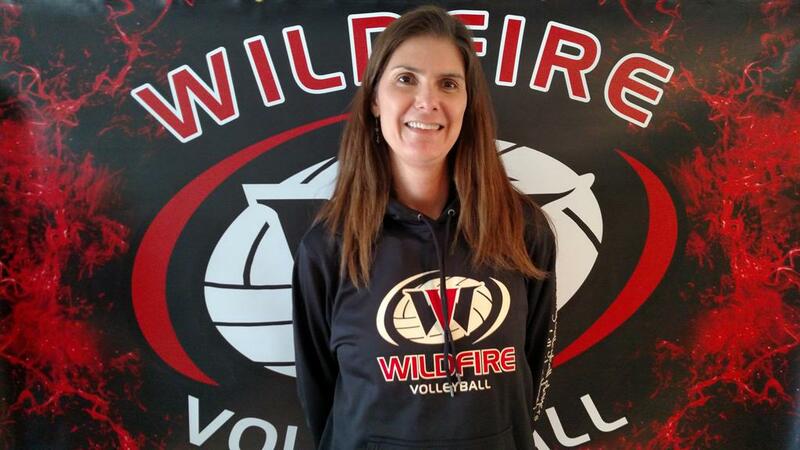 This will be Helene’s 4th year coaching for Wildfire. Through all of Helene’s volunteer work in many different capacities at Ft. Knox including coaching of several different sports she was awarded The Meritorious Service Medal by Major General Jefforey A. Smith. Helene is married to Fred who is a Retired Army Officer and they have three children, Beki 18, Charlie 17 and Shelley 14. Beki currently is playing volleyball on a full scholarship at New Mexico Military Institute.